I have been knitting like a mad thing today when I could, as I was desperate to show a photo slightly further on than I am.....but with family moaning (well, just hubby actually) and light fading I've had to leave it here. Actually, when I laid it out to take the photo it looked a little better than I expected. I am currently doing the hood which is taking forever, but as I have a mahusive head, I don't want to scrimp on it! I have also started a sleeve....so I am getting there! This week I did my three needle bind off, which was easy-peasy, I was a little scared as it sounded complicated, but actually it was (directed by youtube) no problem at all. 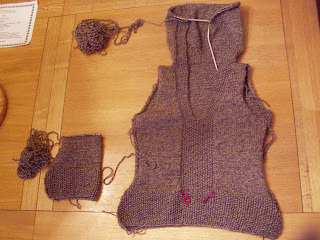 The sweater is really taking shape now.....hopefully my shape...as I am still a bit worried it is a little on the small side.....I have come up with a solution though, I am going to go on a major crash diet to make it fit.......if I stop eating now....it may fit me in a few months. It has been a glorious weekend the weather has been beautiful, making everything seem do-able. 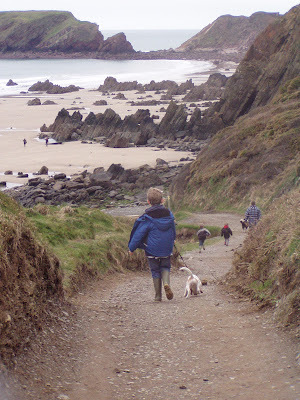 We have fitted in two lovely beach walks....today at a beach about five minutes away. Last year in the early autumn there was a film set here shooting parts of the film 'Snow White and the Huntsman'.......how could the the Hollywood stars who spent a few days here not be touched by the beautiful landscapes of my county.......yep, I am a very proud Welsh girly! Anyway.....bedtime for three tired boys and two sandy dogs....after that I will enjoy sitting down to read about all my fellow blogger's progression on their Year of Projects work. The jumper is really looking great. And the countryside is amazing! It's funny, I too have a mahooooosive head and find that most hooded things just make me look like a retarded elf, should I try to wear the hood up. The answer is certainlly to make your own hooded thing. Good luck, Missus and enjoy your week. That beach looks wonderful, I'd love to explore it. And to have it just five minutes away, lucky you! Beautiful sweater and beautiful landscape. Hubby just sometimes ask me to move my yarn when it's in his way, doesn't really complain about my knitting or crocheting...cept he says I don't pay attention to when we're watching tv and get's irritated if I say what did they say? Not because I'm not paying attention, but because I can't hear it sometimes. That's not however what he thinks! 'Mahusive'! Cracked me up! Never heard that term before! I like it. 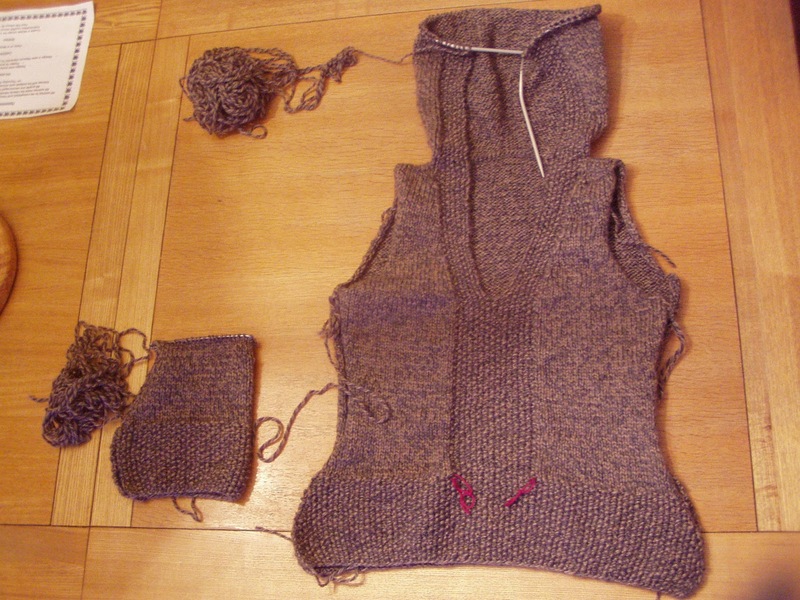 I am greatly impressed by anyone who can actually put a sweater together. It is most awesome. And, I can NOT believe that is the puppy in that photo! He has really grown! Wow! Oh wow look at your sweater, aren't you making great progress...loved the mahusive comment that made me giggle but seriously your doing great and I think it will fit without the diet. Your hoodie looks great so far! And your countryside looks gorgeous - apparently you live in the second most beautiful country of the world, after Canada of course (LOL)! what a beautiful sweater and a dream of landscape. You can't beat a Celtic coastline (says the girl raised in Cornwall by a Scots dad and an Irish/Welsh mum). You are doing such an amazing job on that hoodie. How lovely to be able to take such walks like that. You don't have a massive head,just a gorgeous mane of hair (at least that's how it looks to me). The sweater is beautiful, as is your beach. Lucky you! Your sweater is looking lovely Faith...love the colour too...just the thing for all those walks along the beach at this tome of year...Oh my, you are so lucky to live in such a gorgeous place! Your hooded wonder looks full of promise! Have you noticed how the colour of your yarn marries beautifully with your coastal walk picture? This is all very lovely indeed.